EDMONTON — Rickard Rakell notched a natural hat trick as the Anaheim Ducks beat the Edmonton Oilers 5-1 on Saturday. Corey Perry and Devin Shore also scored for the Ducks (33-37-10). Anaheim has won two of its past three, but is out of the playoff race. Sam Gagner replied for the Oilers (34-35-9), who have lost two straight and are now all but eliminated from playoff contention. Shortly after Jakob Silfverberg rang a shot off the post, the Ducks scored with five minutes left in the first period. Oilers goalie Mikko Koskinen got a piece of a Perry shot with his glove, only to see it trickle behind him into the net. The Ducks took a two-goal lead 1:21 into the second period when Silfverberg kept a puck in at the line and sent it to Rakell, who scored on a one-timer. Anaheim made it 3-0 nine minutes into the second when Rakell backhanded in a rebound for his second goal of the night and his sixth in the past five games. Rakell picked up the hat trick with his third goal of the game with five minutes left to play in the second period, his 18th of the season. Anthony Stolarz replaced Koskinen in net after that goal. Anaheim added to its lead a minute-and-a-half into the third after Shore scored on a blast off of a faceoff. Edmonton broke Ducks goalie John Gibson’s shutout bid with seven minutes left in the third on a goal by Gagner. The Oilers are in Las Vegas on Monday, while the Ducks are off until Wednesday when they host the Calgary Flames. NOTES: It was the fourth and final meeting between the two teams, with Edmonton going 2-0-1 in the previous three. Seven of their past eight games had been decided by one goal, including five which went to extra time. 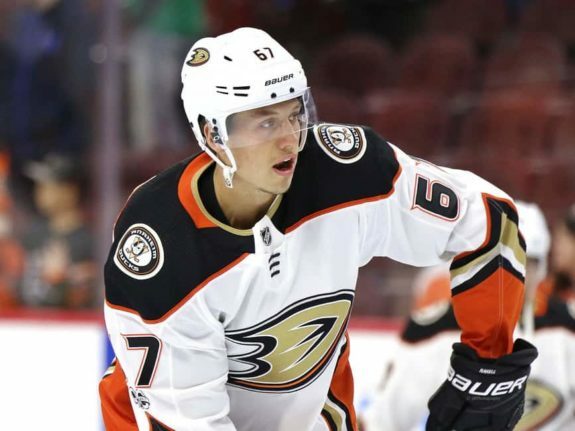 … The Ducks have been hampered by injuries of late, missing the likes of Ondrej Kase (shoulder), Chad Johnson (head), Brendan Guhle (upper body), Ryan Kesler (hip), Nick Ritchie (upper body), Ryan Getzlaf (upper body), Josh Manson (upper body) and Troy Terry (lower body). … In an unusual situation, Ducks defenceman Jake Dotchin was ejected early in the game once it was discovered he had officially been listed as a scratch.